On August 15 or the next closest Sunday The Feast of the Dormition of the Mother of God, known in the West as the Feast of the Assumption, is celebrated by a large portion of the Christian world. 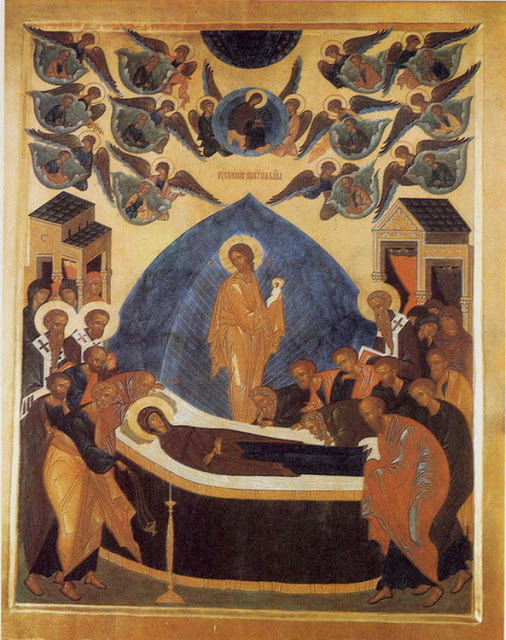 Here we see an icon that portrays the Dormition or falling asleep of Mary. At first glance one might wonder, however, what exactly is being depicted. Who are those figures held by angels traveling down on two lanes on either side of a woman seated within a blue sphere? Then immediately below this unlikely scene there is another scene that looks like a wake of a woman surrounded by a group of mourners: men, women and bishops. Some of them resemble the men above riding with the angels. And if that were not enough, in the center of the icon a mandorla can be seen surrounding the Christ figure who is holding a baby! Having read these few sentences from a series of interviews with Father Zinon entitled Conversations on Iconography (1990), we will now look at our icon again. So far we know that the icon is manifesting the Dormition of Mary, which is based on various apocryphal accounts of her death. Imagine we have just entered the orthodox Monastery Chapel of Pskove-Perchorskiy. We have carefully closed the heavy door behind us and begin to quietly make our way toward the front of the chapel. We stop, because to the left of the royal doors leading to the space of eucharistic consecration we see the very icon image we want to meditate on today. It is so much larger than we first thought it to be. And we are struck by the light as it plays on the gold leaf background, which symbolizes the divine light in which the transfigured live with God. The icon is comprised of two distinct but inseparable moments: first the death and burial of Mary and secondly her resurrection and ascension. Death is understood as the soul separating from the body. Thus we see that Mary has surrendered her soul to Christ, who has received it into his hands and holds it like a baby. A group of mourners has gathered around her deathbed. Many are apostles, enabled by angels to attend her death. We can recognize St Peter with the censor and St Paul by Mary’s feet. We see women and clergy, we see Christ in the center of the icon and angels above him. The whole church is present. The second moment is portrayed by a blue heavenly sphere, in which Mary is seated. This signifies that she was raised up and that it was not by her own power that she ascended, but by that of her Son. Thus the term assumption is often used. What is the spiritual reality we are to contemplate here? We can ponder the fact that our time on earth is limited. Our body and soul will be separated and one hopes that we will, like Mary, surrender our soul with longing and confidence to our Saviour. We may pray that Christ will receive our soul into his arms just as tenderly as this child, as we transition from time to timelessness. The spiritual reality this icon invites us into is surely filled with a beautiful hope. Archimandrite Zinon: Icon of the Dormition of the Mother of God, 1985, natural mineral pigments and gold leaf on gessoed wood panel. Located in the Saint Kornelius Side Chapel of the St. Nicholas Church in Pskov at the The Pskovo-Pechersky Dormition Monastery, Pechory, PskovOblast, Russia. Archimandrite (Vladimir Teodore) Zinon (b. 1953) is a world renowned icongrapher. He studied in the Academy of Fine Arts in Odessa. It was there that he was introduced to icons. Realizing that he would need to dedicate his whole life to mastering iconography, he was tonsured as a monk in 1976 and took the monastic name of Zinon while entering the Pskov-Pechersky Monastery. Today Archimandrite Zinon is the most well known of all Russian iconographers and his efforts continue to influence developments in iconography both in Russia and abroad. April French kindly translated the citations of Father Zinon from a series of discourses entitled Besedy ikonopistsa, Novgorod: Russkaia Provintsiia, 1990/1993. This text was also published later by the Alexander Men Foundation in 1997 and 2003. April French is a Brandeis Scholar and student of the doctoral program at Brandeis niversity, Waltham, Mass, USA. Matthia Langone is a conference speaker and iconographer. An unexpected encounter with some of the most beautiful and renowned Russian icons in the Kremlin cathedrals in Moscow compelled Matthia Langone to embark on a quest to understand the icon. She pursued studies at the Prosopon School of Iconology, the Vancouver Academy of Art, the Angel Art Academy in Florence and the Vancouver School of Theology (D. Min.). She also studied under the Russian master iconographer Vladislav Andrejev. Inspired by his teaching, Matthia assimilated his ‘liturgical method’ into her own Master’s research and concentration in Russian Byzantine iconography, which she completed at Regent College, an international graduate school of Christian studies in Vancouver, B.C., Canada. Matthia’s own work has been exhibited in Canada, shown in Rome and Portugal and kept in private collections. She has designed college courses in Iconography and continues to lecture and give workshops on the topic. She lives in Vancouver, B.C., Canada. See www.wayoftheicon.com.